Irish Women’s Champion Lisa Maguire leads the field by four strokes following a sensational opening 66 and an equally impressive afternoon 73 at the 3 Irish Women’s Open Strokeplay at Douglas Golf Club. In blustery but dry conditions, Maguire opened her championship with two bogeys but five birdies over her next seven holes saw her turn three under par and a further five birdies over the front nine at Douglas saw her sign for a sensational morning round of seven under par and a four shot lead at lunchtime. Maguire went on to coast around the 6149 yard course in level par in the afternoon to lead the field by four strokes with just 18 holes remaining. Next best was Scotland’s Jane Turner who battled the blustery conditions to return an impressive three under par 70 in the morning and a level par round in the afternoon sees her comfortably hold second place. Four shots further behind sees Lisa’s twin sister Leona, after steady rounds of 73 and 74, who shares third place with England’s Hannah Burke and Australian’s Stacey Keating and Julia Boland. In the team event, Ireland lead Scotland by 2 shots followed by Australia in third place, 5 shots further back. The top forty players who survived today’s 36 hole cut commence their final round at 8.30am on Sunday with the leaders teeing off at 10.50am. Spectators are welcome to come along to what surely must be Lisa Maguire’s finest hour as she attempts to add the Irish Open Strokeplay title to her Irish Close Championship win in May and become Ireland’s first winner since Martina Gillen’s victory in 2006. 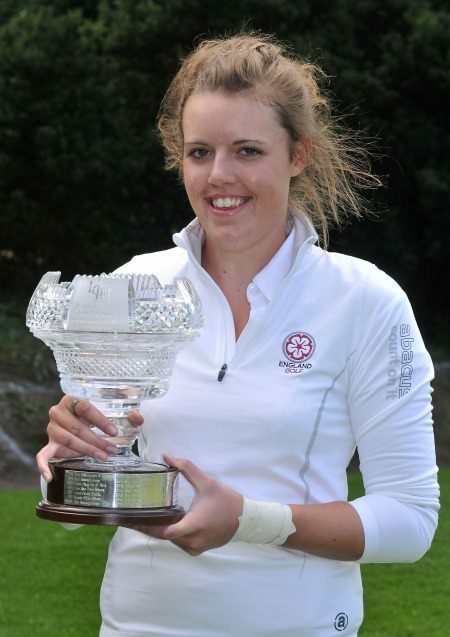 England’s Lucy Goddard led from wire to wire to win the Irish Women’s Open Amateur Strokeplay title by a stroke from Castletroy's Chloe Ryan at Douglas. Curtis Cup star Breanne Loucks (Wales) fired a final round 73 to beat Scotland’s Roseanne Niven by three strokes at the Irish Women’s Open Strokeplay at Elm Park Golf Club, 28 June 2008.